﻿ Fun Easy English - Travel the United States of America - New York. Learn before you travel. This section of Fun Easy English focuses on facts and other cool stuff about your favorite U.S. state. This is great English reading practice. 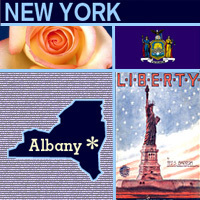 This page focuses on the state of New York. The New York state flag features the state's coat of arms on a field of deep blue. Although the state flag wasn't adopted until 1901, New York's coat of arms was officially adopted in 1778 (the state seal also features New York's coat of arms). The center shield displays a masted ship and a sloop on the Hudson River river (symbols of inland and foreign commerce), bordered by a grassy shore and a mountain range in the background with the sun rising behind it. A banner below shows New York's state motto ("Excelsior," Latin for "ever upward"). Liberty and Justice support the shield and an American bald eagle spreads its wings above on a world globe. Liberty's left foot treads on a crown (a symbol of freedom from the Kingdom of Great Britain). Justice is blindfolded and holds a sword in one hand and a scale in the other, symbolizing impartiality and fairness. Origin of Name Named after England's Duke of York. Travel and tourism site for New York - This state travel and territorial tourism site provides ideas for your vacations, meetings, and more. Almost all of us have relatives who came from someplace other than the United States. People who came to America to live are called immigrants. From the 1850s through the early 1900s, thousands of immigrants arrived in the United States and lived in New York City. They first came from Ireland and Germany and later from Italy, Eastern Europe, and China, among other places. Because most immigrants were poor when they arrived, they often lived on the Lower East Side of Manhattan, where rents for the crowded apartment buildings, called tenements, were low. The Lower East Side Tenement Museum is in a building that used to be a tenement and it tells the story of immigrants in the City. It was built in the 1860s and could house 20 families, four on each floor. Each apartment had only three rooms: a living or "front" room, a kitchen, and a tiny bedroom. Often seven or more people lived in each apartment. Not only was the tenement crowded, but also, until 1905, there were no bathrooms inside the building. Residents also did not have electric power until after 1918. The Museum has re-created the apartments to look like they did when families lived there. This photograph shows what the Rogarshevksy family's kitchen looked like in 1918. Abraham and Fannie Rogarshevsky arrived with their four children from Russia in 1901. Later, they had two more children in the United States. While they lived in this tenement, a boarder (someone who pays for food and lodging in another person's home) lived with the family. That would have made nine people living in a three-room apartment! You may think that lighthouses are interesting to look at, and they are. But they also serve a very useful purpose. Lighthouses guide ships sailing near a coast. They are built in different kinds of places: important locations on a coast, harbor entrances, islands, rocky ledges or reefs, and even in the water. They project strong beacons of light at night so ships can see them. Lighthouses help ships identify their locations, warn them of danger, and serve as a marker of nearby land. The Montauk Point Lighthouse on Long Island, New York, is more than 200 years old. Built in 1796, it is the oldest lighthouse in the state. It has guided whaling ships, fishing boats, steamships, submarines, and sailboats for many years and continues to do so today. The tower is more than 110 feet tall, and a person has to climb 137 steps to get to the top. But the Montauk Point Lighthouse is not just a tower. Attached to it is a house in which the lighthouse keeper lived with his family and assistants. Since the light on top of the tower was automated in 1987, the lighthouse no longer needs a keeper. Before the Civil War, if you were black and born a free man you could still be forced into slavery. That's what happened to Solomon Northup. Northup was born a free man in Minerva, New York, in 1808. He was a carpenter and talented fiddler. In 1834, he and his wife moved to Saratoga Springs, New York, where they had three children. In 1841, Northup met two men who claimed to be from a circus. Because he needed the money, Northup agreed to join them as a fiddler in Washington, D.C. Once they reached Washington, however, the men drugged, chained, robbed, and sold him to a slave trader. Northup was shipped south to New Orleans, along with other slaves, where he was sold in a slave market. He spent the next 12 years as a slave, working for three masters. Northup worked hard and endured much cruelty, but he was always looking for the chance to escape or contact his family and friends in New York. Finally, in 1852, Northup befriended Samuel Bass, a Canadian carpenter. With his help, Northup sent a letter to his friends in New York. Through the help of his friends, he regained his freedom in 1853. Northup returned to New York, where he was finally reunited with his family. Northup wrote a memoir, Twelve Years as a Slave, about his experiences. But this book isn't his only legacy. Northup has many descendants, who gathered together in Saratoga Springs on July 24, 1999, for a tribute to their ancestor. The town of Saratoga Springs declared July 24 as Solomon Northup Day to remember the suffering of Northup and other African Americans who lived as slaves. 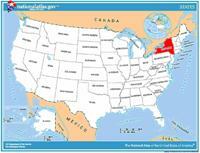 The following is a description of national forests and monuments in the state of New York. There are no national parks in this state. If you plan to visit or live in New York for awhile then you should definitely plan to visit some of these fantastic places. Re-discovered in 1991 during excavations for a new federal building, this former burial ground that contains the remains of more than 400 free and enslaved Africans buried during the 17th and 18th centuries was designated a National Historic Landmark memorial in 1993. A circular sandstone fort built in 1811 at the southern tip of Manhattan to protect New York City from the British, Castle Clinton is now located in Battery Park. It later became a beer garden, a theater, the first immigration station (predating Ellis Island), and a public aquarium. Fort Stanwix guarded a strategic 18th century portage known as the Oneida Carrying Place. It was built during the French and Indian War (1754–1763). The fort successfully resisted the 1777 siege by a British invasion army during the Saratoga campaign of the American Revolutionary War. Erased by the development of Rome, New York, it was rebuilt as a national monument in the late 1970s. From 1783 to 1966, Governors Island in New York Harbor was an Army post, and from 1966 to 1996 it was a Coast Guard installation. 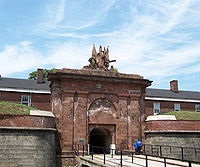 Located on Governors Island are Castle Williams and Fort Jay, which served as outposts to protect New York City from sea attack. 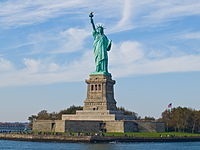 This iconic statue, built in 1886 on Liberty Island and 151 feet (46 m) tall, commemorates the centennial of the signing of the United States Declaration of Independence and is a gesture of friendship from France to the U.S. Liberty Enlightening the World is a symbol of welcoming immigrants to the U.S. and is listed as a World Heritage Site. Ellis Island, where 12 million immigrants entering the U.S. passed through, is included in the monument. This national monument is also partially located in the state of New Jersey. 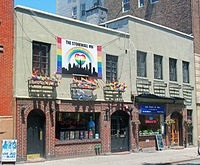 The Stonewall Inn, often shortened to Stonewall, is a gay bar and recreational tavern in New York City and the site of the Stonewall riots of 1969, which is widely considered to be the single most important event leading to the gay liberation movement and the modern fight for LGBT rights in the United States. 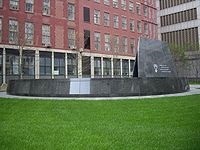 Also included in the 7.7 acre site is Christopher Street Park, across the street.